In my No Age review the other day, I mentioned how bands don’t make first albums anymore; instead, they’re making demos and MySpace tracks and digital 7″s until people start paying attention. The flip side of that is bands aren’t necessarily trying to sell their first albums. 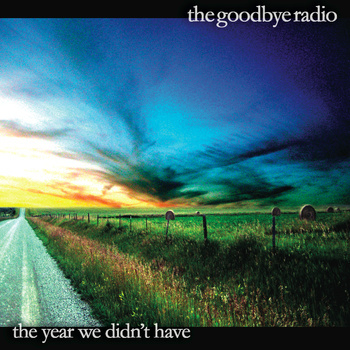 The Internet is littered (or blessed, one might argue) with free EPs and singles and even whole records — like the Goodbye Radio’s The Year We Didn’t Have. The band tells me this one’s just to get people’s attention — when they finish their sophomore album next year, they’ll try to actually sell the damn thing. It seems like a bizarre situation, right? To accomplish the serious goal of completing a serious, professional-sounding record — which this is — and sacrificing it on the altar of social networking and Internet buzz? As someone who’s been getting digital albums for free one way or another for the last decade, I’m surprised to have mixed feelings about this, but there they nevertheless are. What I’m trying to say is The Goodnight Radio’s The Year We Didn’t Have is a wonderful record and we should give them money for the pleasure of having heard it. It’s the kind of album that probably should get an alt-country tag, but like the Old 97’s or Whiskeytown before them, it’s equally indebted to good, clean guitar pop — Tom Petty, mostly, but you can hear all of the Traveling Wilburys here. The production is soapy and sweet, full and bright enough to actually imagine hearing it on country radio after the new Taylor Swift single, but with actual air — not Auto-Tune — resonating in the recordings. It’s not a record by bedroom kids. Singer Mike Aronow (who sounds like a huskier John Stirratt, whose Autumn Defense would be obvious peers) and bandmate Jeff Walsh’s previous act, Endgames, were making albums as far back as 2001, which might be why the group seems interesting in giving this one away in hopes of a fresh start. The Year We Didn’t Have is the kind of album that slips through the cracks: too genuinely good for mainstream attention but too seemingly middle of the road for kids with choppy haircuts and iPads. Owning a synthesizer and a laptop microphone doesn’t mean being worthwhile; being the Goodbye Radio does, though. So give it a go — it’s free, after all. Then, if the urge strikes you, order a signed CD for $2. You can always give it to your dad.